People like to go all out for New Year’s Eve, and with it being the last party of the year, it is easy to imagine why people want to leave a lasting impression and make great memories. Whether you are planning on a small celebration at home, attending a big party, or even hosting a shindig of your own, you’re going to need to eat. And you’re going to need that food to help you make it all the way through the countdown! 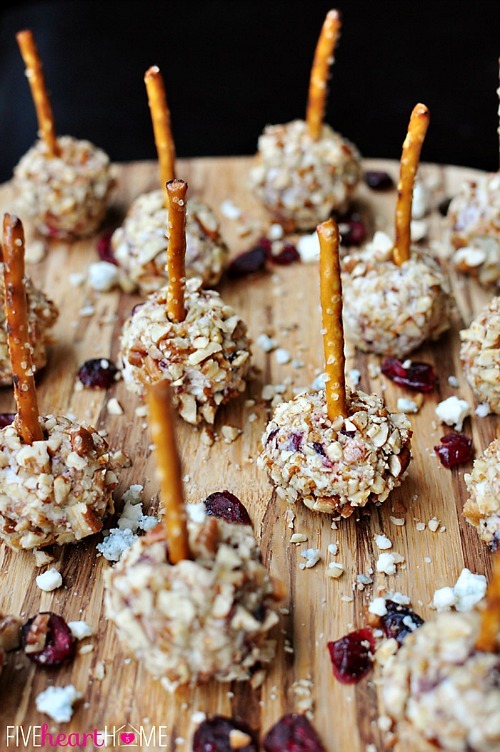 New Year’s Eve parties are the perfect backdrop for fabulous appetizers, sweet treats and dip. Lots of dip. 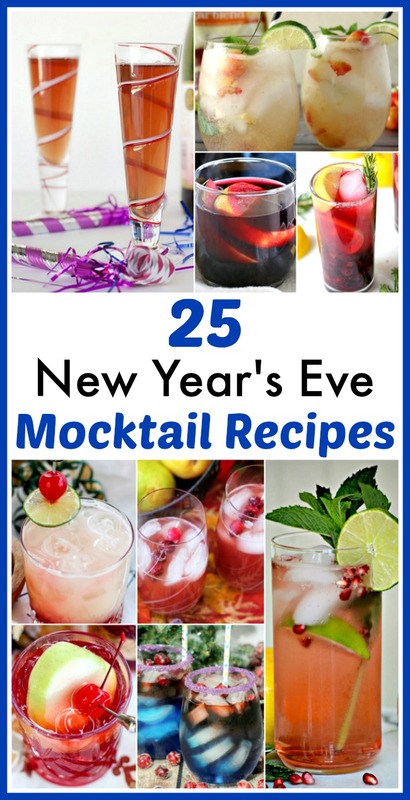 But there’s more than just dip recipes to choose from for you New Year’s Eve party! 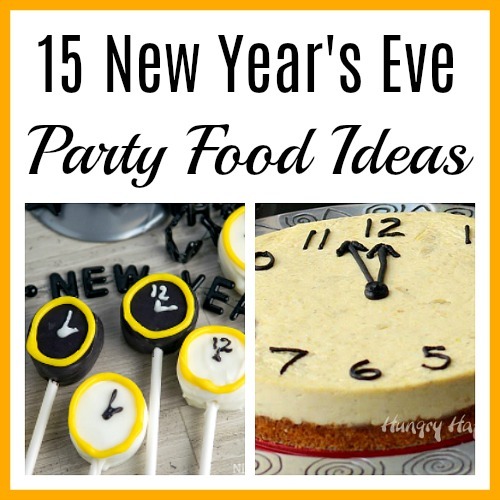 Check out these 15 New Year’s Eve Party Food Ideas! From bacon wrapped sausages, to cheesecake clocks, to layered dips, here are 15 New Year’s Eve party food ideas for you to add a little something memorable to your celebration. 1. 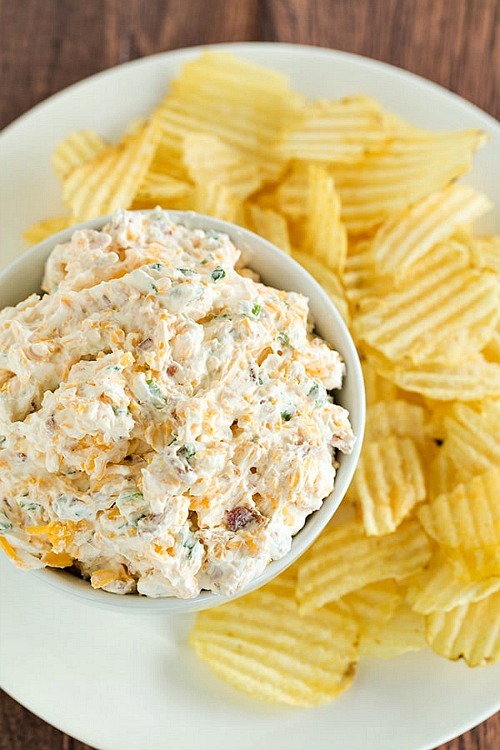 Dips, especially unique ones, are always good party fare and this Hot Crab Dip by Six Sisters’ Stuff will be a big hit at the party! 2. 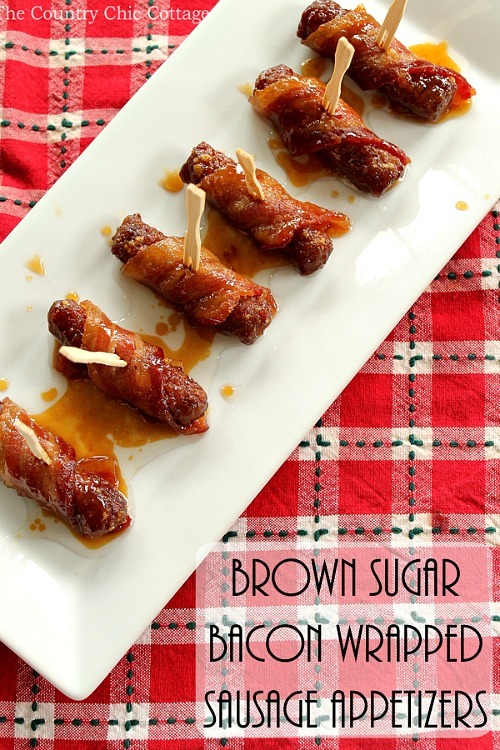 These Brown Sugar Bacon Wrapped Sausage Appetizers by the Country Chic Cottage are going to be the one that guests will want the recipe for. And how you could you blame them? 3. 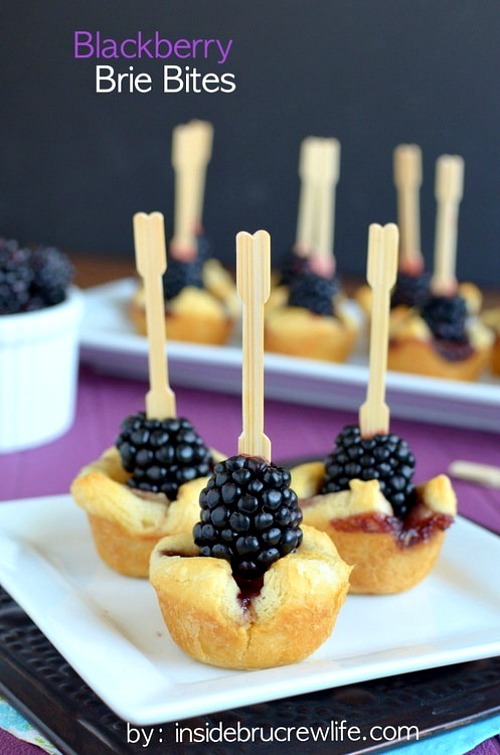 These Blackberry Brie Bites by Inside Bru Crew Life are ideal on serving skewers, and let’s face it, it’s nearly impossible to go wrong with brie. 4. 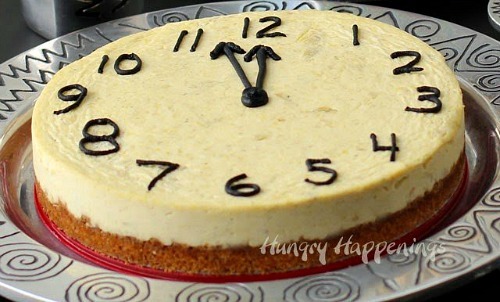 I sure hope somebody I know makes this Parmesan Artichoke Cheesecake by Hungry Happenings! It’s too cute AND there’s also a tutorial for some festive Times’ Square Cheese Balls! 5. 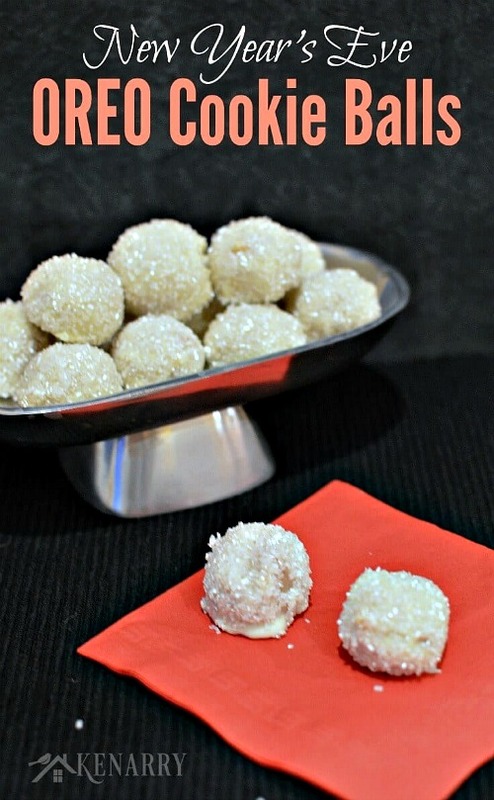 These Oreo Cookie Balls from Kennary are a festive sweet treat to add to your dessert table on New Year’s Eve! 6. 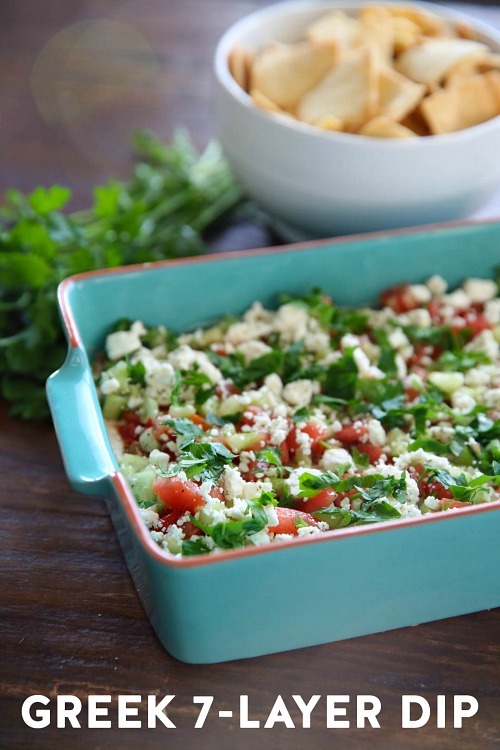 Again with the dip – this 7 Layer Greek Dip by Our Best Bites is packed full of great (and inexpensive) things and would work with pita crackers, regular crackers, even nachos! 7. Every party needs a cheese ball – and these Mini Cheese Ball Bites from Five Heart Home are just perfect for the occasion! 8. 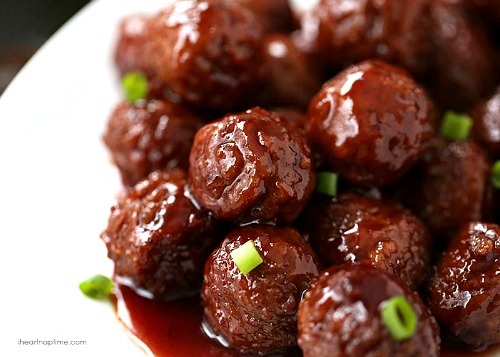 It doesn’t get any easier than Crockpot BBQ Meatballs by I Heart Naptime. Make this your contribution to the party and let them cook themselves. 9. 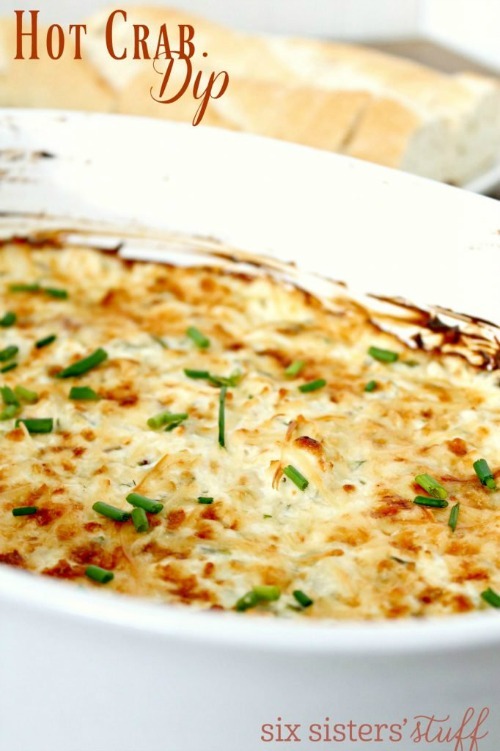 Your guests will love you forever when you make this Loaded Baked Potato Dip by Brown Eyed Baker. It’s so easy (and cheap!) to prepare, and so so good! 10. 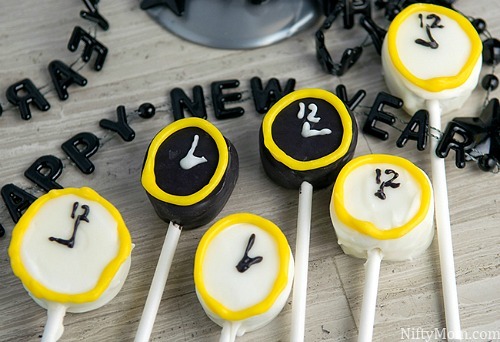 These New Year’s Eve Marshmallow Clocks by Nifty Mom are just too cute! Perfect for the kids and the adults! Also, you could make some for every hour and use them as countdown treats! 11. 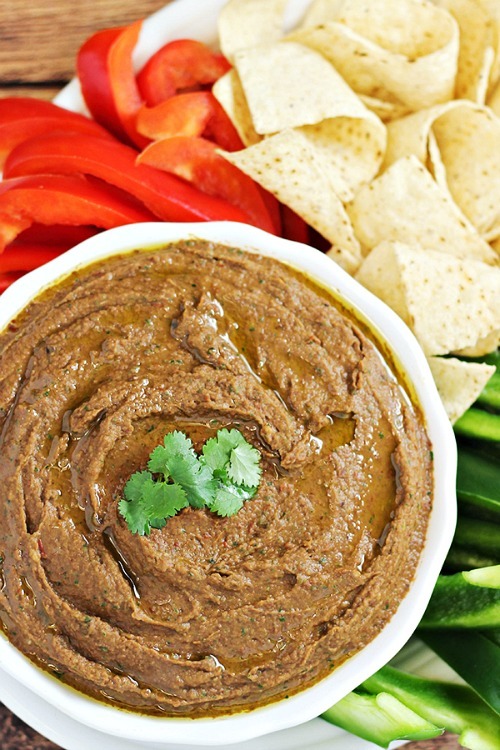 Another fabulous dip is this Easy Black Bean Chipotle Dip by Home Cooking Memories. It’s all about the easy and the frugal, and I think this would actually go quite well with a loaf of pumpernickel. 12. 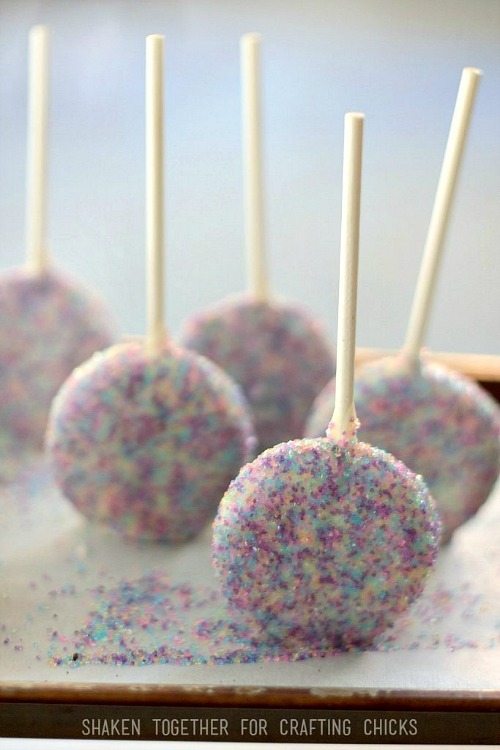 Another treat for the sweets table are these Oreo Ball Drop Pops by the Crafting Chicks. Very fun and festive! You can get a nice bulk order of cake pop sticks on Amazon. 13. 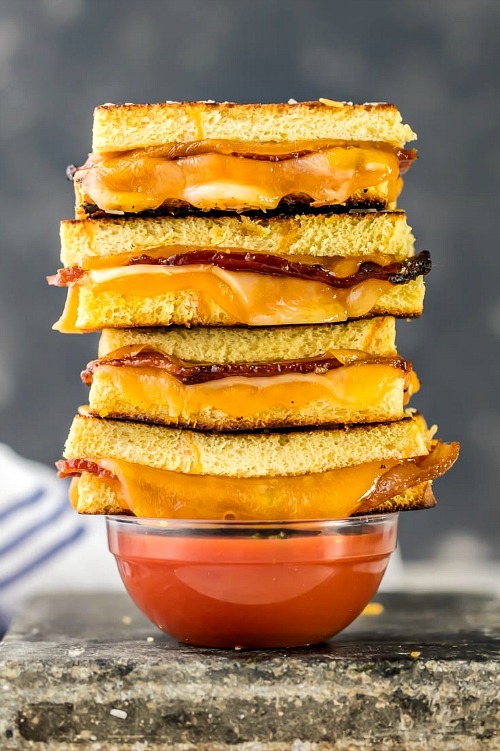 These Candied Whiskey Bacon Grilled Cheese Dippers by the Cookie Rookie are going to be perfect for later in the evening – when you’re needing that extra fuel to make it all the way to midnight. 14. 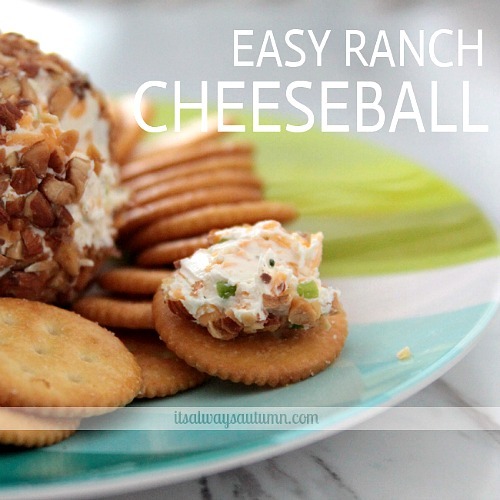 This Ranch Cheeseball by It’s Always Autumn is easy, like really easy, and will go great with your favorite crackers. Also, the leftovers (if you have any!) are going to be amazing for breakfast. 15. 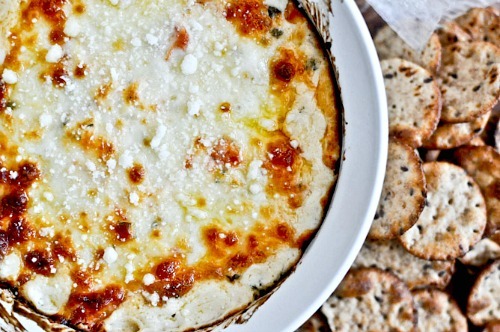 And one last killer dip for the list is this White Pizza Dip by How Sweet Eats. This one packs a big wow factor, so be sure to keep the napkins handy! Where possible, make ahead. Do any chopping for dips and appetizers a day or two ahead and refrigerate. Cheese balls can and should be made a day or two ahead as this gives great texture and richer tastes. Most desserts and treats can be prepared a day or two ahead as well, and this can take a lot of the party planning stress out of the mix. Shop the sales for things like crackers and nacho chips, and remember when you’re serving meats to keep them warmed to right temperatures before serving. Stock your food serving area with lots of serving utensils and napkins.